The Paragon BlueBird XL(INCLUDES SHIPPING**) PLEASE NOTE REGARDING FREE SHIPPING: **Please note that shipping is included door to door to most Metropolitan Australian addresses but is subject to a final shipping quotation from Paragon Industries. Paragon Industries designated couriers do not ship to some out of area and rural addresses and an additional local courier fee may apply from your closest Metropolitan City airport to your address. If in doubt please request a quotation door to door to your physical address. 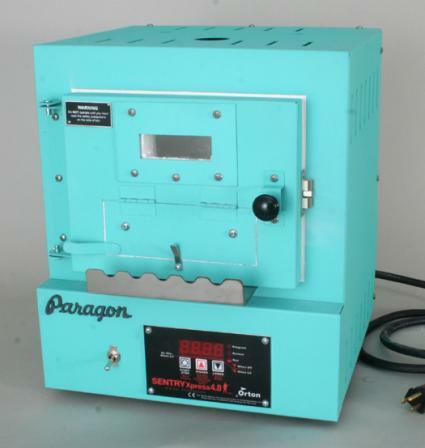 The Paragon BlueBird XL has a new and improved ceramic fibre roof and firing chamber, thicker doors with new gaskets, heavier mandrel holders, and a stainless steel control panel. The BlueBird XL is a dream kiln for the glass bead enthusiast. This 50.8cm wide, 20.32cm deep kiln safely anneals glass to prevent breakage during cooling. 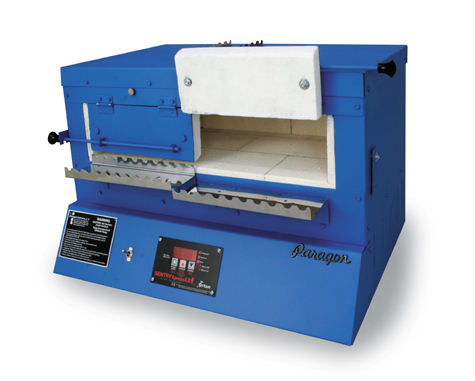 With your own Paragon annealing kiln, you will never again worry about stress fractures in your glass. The kiln opens doorways of opportunity in beadmaking. The 25.4cm wide double doors give a total of 50.8cm width for inserting bead rods. This kiln is ideal for seminar teachers. It is like having two kilns in one. The user-friendly 3-key Sentry Xpress digital controller maintains the annealing temperature. Program it for the length of time desired. Adjust the cooling rate through the annealing range. The controller is packed with features but is user friendly. The BlueBird XL features new sinusoidal “wavy” elements, which are embedded close to the inner surface of the high-tech, vacuum-formed ceramic fiber top. This is an improvement over our earlier embedded coiled elements, because the “wavy” elements are mounted closer to the surface. This enables the elements to radiate heat faster for longer element life. The ceramic fiber top reduces dust inside the kiln. The BlueBird XL now features ceramic fiber walls and bottom, which replace the firebrick walls and bottom of earlier kilns. The BlueBird XL, with its space-age ceramic fibre, heats faster than ever. Both doors are 914mm x 254mm and mounted in a 109mm high opening. The 228mm gap under the doors is filled by flexible, high temperature door gaskets, which help to hold in heat. The 508mm thick ceramic fibre doors are twice the thickness of our original doors. The hinges are continuous across the top for extra longevity. The kiln comes with one single and one double mandrel holder. The single holder supports rods or mandrels from one point; the double cradles the rods at two points. The holders are held to the kiln by magnets. They are sturdy and heavy duty for long life. Rare-earth magnets hold the doors closed while the kiln is heating to annealing temperature. Phenolic knobs on the door handles stay cool to the touch. Use the switch on the front panel to turn off power to the controller when the kiln is not in use . We have added a glass rod warmer to the top of the kiln. Pre-heating the glass rods saves production time. The steel base supports the kiln in two layers. The upper steel base supports and strengthens the firing chamber; the lower steel base covers the entire kiln bottom where it rests on your worktable. Electrical components are mounted to the lower base, away from the heat of the firing chamber. The Sentry Xpress digital controller is mounted under the kiln in an ergonomically sloped panel for easy operation. The design saves table space over kilns with a side switch box. The built-in base stays cool even during extended hold times for the long life of the electrical system. It is slotted to dissipate heat and comes with mar-proof plastic feet. The BlueBird XL plugs into a standard household outlet. It ships in a special carton with vacuum-formed padding to assure that the kiln will arrive safely. The BlueBird XL is made in Mesquite, Texas USA to exacting standards. The kiln is coated with durable high-temperature water base paint, which produces low emissions during spraying. This is better for employees and the environment. The Sentry Xpress 3-key controller is packed with features. It includes two modes: Single Speed and 8-segment Ramp-Hold. The solid state controller continually monitors the firing so you can spend your time productively without closely watching the kiln. The sealed controller touch pad keeps out dust and is easy to wipe clean. The controller is easy to use. Read the manual and watch the instructional videos on our website. The kiln includes a Quick Start programming guide and a 16-page controller instruction manual, printed in color. Brighten your studio with colour! Order your kiln in one of our standard colours at no extra charge . . . berry, black, blue, hot pink, jade, navy, purple, or turquoise. Delivery is estimated at - 3-4 weeks. Shipping is direct from the Paragon factory in the USA to the customer in Australia. Please note: in the event that the courier may need to contact the customer regarding the delivery, it is necessary for a contact telephone number to be supplied by all Australian customers who purchase Paragon Kilns. Customers Please Note: WE ARE DISTRIBUTORS/AGENTS FOR PARAGON INDUSTRIES USA. PARAGON KILNS ARE NOT STOCK ITEMS FOR US. 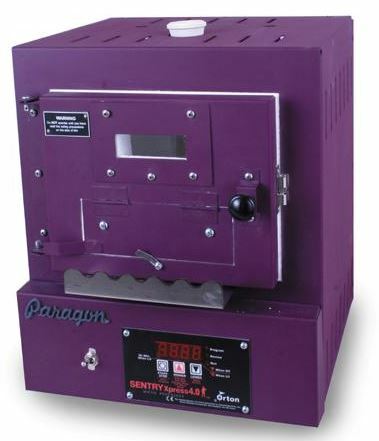 ALL PARAGON KILNS ARE CUSTOM MANUFACTURED IN THE USA TO MEET AUSTRALIAN STANDARDS. THEY ARE DELIVERED DIRECTLY TO AUSTRALIAN CUSTOMERS FROM THE PARAGON INDUSTRIES FACTORY IN THE USA. ALL CUSTOMS DUTIES AND GST DEEMED TO BE PAYABLE ON ENTRY BY AUSTRALIAN CUSTOMS, ARE THE RESPONSIBILITY OF THE KILN RECIPIENT, ADDRESSEE OR PURCHASER AND ARE NOT INCLUDED IN OUR QUOTED PRICE OF KILNS, ACCESSORIES OR SHIPPING. THE KILN'S SHIPPING/CLEARING AGENTS (MOST OFTEN UPS, FEDEX OR TNT) WILL ADVISE THE RECIPIENT OF THE AMOUNT PAYABLE ON ENTRY. CUSTOMS ENTRY FEES VARY BUT GST IS 10%.